OK, I admit it. I'm not a huge fan of grey jets. Don't get me wrong, I build models of them and enjoy the experience, but I'd just as soon build something with a nice camouflage scheme than multiple shades of grey. Yet that is how modern aircraft are painted and while I hope it is a phase they will soon leave behind before I die, I doubt it. Right up there in the 'greys r us' category is the new F-22A Raptor. This incredibly expensive aircraft is the latest in the USAF inventory and has been slowly entering squadron service for the last few years, starting with the training unit at Tyndall AFB and then moving to the 1st FW at Langley AFB near Norfolk, VA (hey, just like the F-15 did 30 years ago). Modern jet aircraft have a gestation period that is longer than the development and service life of planes of the 1930s and 1940s. Probably due to the need to incorporate and combine a nearly bewildering array of systems into an integrated package. Gone are the days of 'kick the tires, light the fire and off we go'. The F-22 won a competition against the Northrop YF-23 that was too close to call as both aircraft performed the mission superbly. In the end, it was either a political decision against Northrop (who has never had really good relations with the politicians) or the 'fact' that the YF-22 would be easier to construct (though to many it made little difference) that gave the (hey how about a bribe and a nice lunch) Lockheed crew the nod. Despite the fact that the plane has been in service for many years, your editor has never seen one (or a Super Hornet for that matter), as these planes just don't seem to hang out around here. Of course, those that fly the plane say it is just the best that there ever was and I'm sure they are 100% correct. One thing I know, there will never be the numbers built to match even the F-15 for production as the cost per unit of modern high-tech military jets is such that the Air Force and whomever also gets the plane (any bets on Israel), won't be able to afford a lot of them. Having the production run terminated also means that we won't be seeing many, if any, more. This is a new mold (2009) kit and typical of Hobby Boss, it is really quite well done. Molded on four grey plastic and one clear sprue, the kit has your usual engraved detailing and to make it worth thei money, at least in the eyes of Hobby Boss, it has full weapons bay detailing. 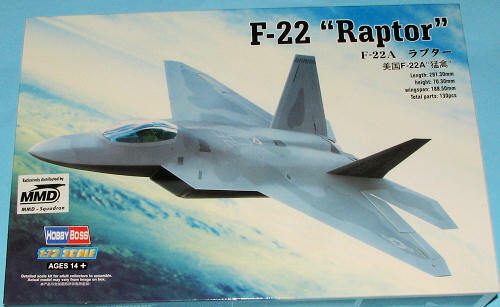 Not only that, but a first in F-22A kits in this scale, it has wing racks for JDAMS. I've not been following this aircraft much so I wasn't aware that it had any ground attack capabilities, but apparently so. Also typical of Hobby Boss, the holes for the wing racks are already opened up. Frankly, I wish they would not do that as perhaps I don't want to install the wing racks and bombs. The cockpit is fairly well done with a five piece bang seat, a nice tub with side consoles, instrument panel and control stick. Though there is some detailing on the side consoles, the instrument panel is a blank on which one puts a decal. Fine in this scale for most of us. Of course, a resin seat will really help things out as the kit seat is a bit light on details. The cockpit is covered by a one-piece canopy with no open option. The modeler also has to paint this smoke grey. You do get full weapons bays with this as well as a complete complement of air to air missiles and their various racks. The bay doors are only designed to be displayed open with no closed option. Perhaps by cutting off the various hinges one could mold this closed, but it would be preferable to have the option. The landing gear is quite sturdy but the wheels are not well defined. It is one of those deals where not only is wheel detail shallow, but there is no demarcation line between where the wheel stops and the tire begins. I find it difficult to understand why Hobby Boss has not realized that it is OK to put a raised area for the rim of the wheel to ease painting. Instructions are very well illustrated with paint references where needed. Painting this with all that stuff open will be a challenge and I expect most will paint it before attaching weapons and doors. Markings are for a single aircraft from the Operational and Test unit. The camo is listed as Light Gull Grey with Dark Compass Ghost Grey patches. I doubt the Light Gull Grey color, so you should seek out more information on the actual colors of the aircraft. The decal sheet is well printed so should provide no problems. Fortunately, there are several decal sheets that offer a wide variety of other unit markings. Despite those few areas of concern, the Hobby Boss kit is a nicely done one that will make into an equally nice model. 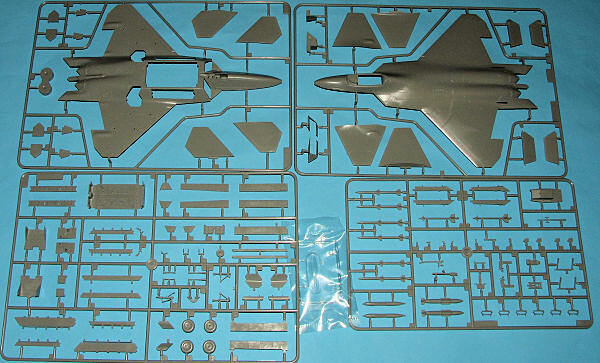 I know that Revell AG also has a nice F-22A and for those who want to have a sleeker, closed up version, then perhaps that would be the one to choose. If you want things hanging out, then the Hobby Boss kit will fill the bill nicely.